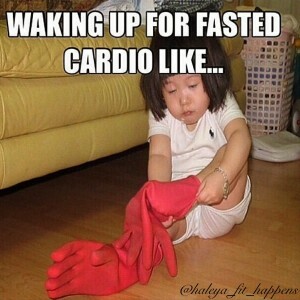 Fasted Cardio? Does it Work? Cardiovascular exercise, or cardio for short, is an essential to a fit persons life. Or basically any ones life. Whether it is running on a treadmill or jumping rope, cardio is a great way to burn fat and stay in shape. One new and up and coming exercise technique to better your results with your cardio is called “fasted cardio”. Fasted cardio is when you do a cardio session right when you wake up in the morning. But the catch is, it’s done on a empty stomach. on an empty. A lot of people might argue that this technique does not work or is not safe because you need protein to fuel your body for a hard workout. Well, in short, the answer if fasted cardio is effective or is safe is, yes. So what does fasted cardio do to your body? Well I found information here and here to help me explain what it does exactly. Basically doing cardio on an empty stomach, right after you just wake up, makes your body burn the fat you have contained in your body, instead of burning the fat of the food you just ate. Meaning your are burning the stubborn stored fat instead of the fat from the bagel you just shoved down your throut before you run out the door to the gym. This technique is manly used to speed up fat loss in the body and can also help regulate your metabolism. But why? When you go to sleep, your body is fasting all night, resting itself. During this time of fast many things happen throughout your body. Your insulin levels and blood levels drop, while growth hormone levels increase. This fasting period of your day is when your body is forced to metabolize fat quicker. When you eat before you work out, your insulin levels increase and you food is being absorbed. Opposed to fasted cardio when you don’t eat, your levels of insulin are low, which causes your to use glucose to power through your workout and burn stored fat. Fasted cardio works because it depends of fat cells already in the body for fuel and helps balance your hormones and your metabolism. This exercise technique could be really successful for women, wanting to slim down and loose fat. There are multiple ways of doing fasted cardio. One way to do it while getting maximum results is by using high intensity interval training. Using this form of fasted cardio you will burn a great amount of fat. This entry was posted in Uncategorized on September 15, 2016 by Audra Wren Laskey. This blog post caught my attention because I had never heard of “fasted cardio” before. The concept of fasted cardio is very interesting to me, and I will have to try it sometime to see how I really feel about it. It seems strange to exercise on an empty stomach, but the facts that you provided explain how it is effective. Although fasted cardio seems to have lots of great benefits, I prefer to workout at night. The question of whether morning or evening workouts are more effective has always interested me. Here is an article that compares the pros and cons of morning and evening workouts.